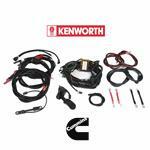 Kustom Truck is your supplier of choice for Cummins engine installation harness for installing a Cummins engine in a Peterbilt glider kit, Kenworth glider kit or Freightliner glider kit. Kustom Truck can supply you with an OEM quality plug and play harness for the installation of a Cummins ISX, Cummins ISM, Cummins Signature 600, or Cummins N14 engine that require no modifications or re-works. Kustom Truck also has an excellent tech support group to help you with tech support during installation.